VEGETABLE PLANT SUPPORT NETTING IMPROVES PHYTOSANITARY CONDITIONS MUCH MORE ECONOMICALLY THAN CAGES AND STAKES. Tomatoes require plenty of room to grow well, and vegetable support becomes key. 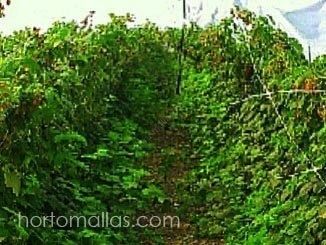 Space rows of staked or caged tomatoes approximately 30 to 42 inches (0.8 to 1.1 m) apart, and allow 24 to 30 inches (61 to 76 cm) between plants in each row. 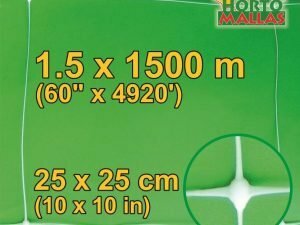 If plants cannot be staked, rows should be spaced 6 feet (1.8 m) apart, with 4 feet (1.2 m) between plants in the rows for adequate air circulation and plant development. Virtually all indeterminate plants require some type of support, and many determinate types benefit from staking or caging as well. Though providing support requires more initial work, it makes caring for tomatoes easier than letting them sprawl on the ground. Since the fruit is off the ground, damage from rot and insects is reduced. Spraying is easier and may be required less often, harvesting is much less work, and the plants take up far less space in the garden. The three most often used techniques for support are caging, staking, and trellising. Stakes are an old but expensive method for plant support, as it requires each plant to have its own pole! 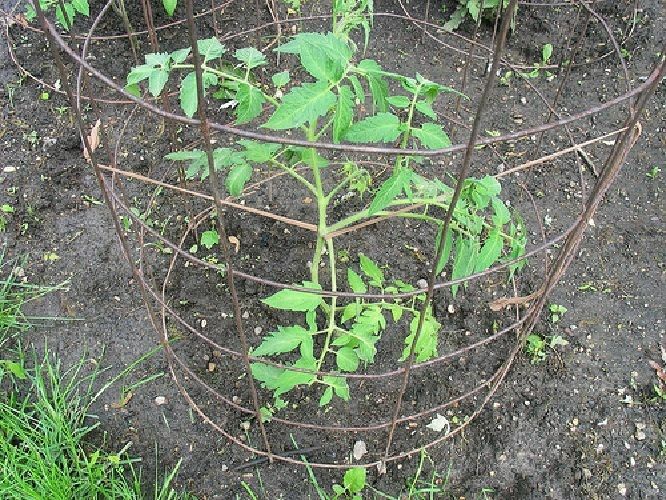 Growing tomatoes in wire cages is a popular method among gardeners because of its simplicity. Shortly after plants are established, place cylindrical cages around them. in diameter works well; a 6-foot (1.8-m) length of fencing makes a cage 19 inches (48cm) in diameter. 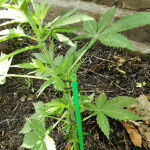 Use shorter cages for determinate varieties and taller ones for indeterminate types. Be sure that openings in the cage material are at least 6 inches (15cm) square to permit you to reach through and harvest the fruit. 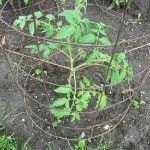 Tomato plants in wire cages do not require pruning, but some gardeners prefer to prune plants to 3 or 4 main stems to keep them more manageable. caged tomatoes can make up for the extra space required with exceptional harvests. 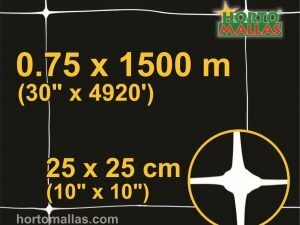 HORTOMALLAS is a viable and economical alternative to wire tomato cages. Some gardeners prefer to stake tomatoes for support. Use sturdy wooden stakes 6 feet (1.8 m) long and 11⁄2 to 2 inches (3.8 to 5 cm) wide. Drive them 1 foot (30 cm) into the soil about 4 to 6 inches (10 to 15 cm) from the plant soon after transplanting. Attach heavy twine or strips of cloth to the stakes every 10 inches (25.5 cm). As the plants grow, pull the stems toward the stakes and tie loosely. Staked tomato plants usually require pruning to a few main stems. At the junction of each leaf and the first main stem, a new shoot will develop. Choose one to three of these shoots, normally at the first and second leaf-stem junction, for the additional main stems. 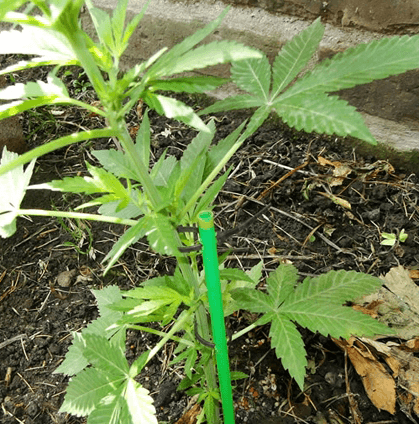 Once a week, pinch off most of the other shoots, called “suckers,” with your fingers to keep the plants from becoming too large for their support. 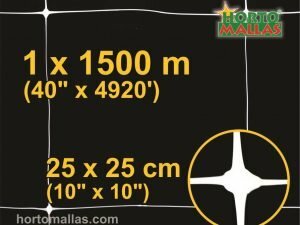 HORTOMALLAS plant support netting allows the plant to attach itself to a larger surface and reduce humidity related diseases. 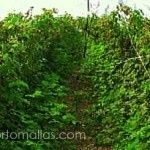 Trellising for plant support is similar to staking in that plants are tied at regular intervals and pruned in a manner similar to that used with stakes. 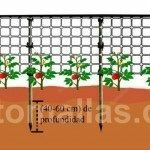 Plants may be set along a fence or planted near a large, strong trellis, then trained upward as they grow.